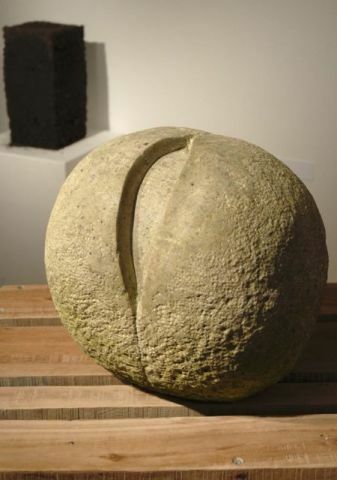 ‘Tension’ is a show of work by artists invited by curators, Franny Swann, Rosalind Barker, and Sue Evans. Prefaced by a number of definitions of ‘tension’ it shows nine artists’ work. An eclectic mix of objects, ideas, and materials infused with the difficult relationship between concepts and their objects. Questions concerning ‘What am I looking at?’ ‘What does it look like?’ ‘What does it feel like?’ ‘What can it mean?’ ‘Where has it come from?’ ‘What is the experience?’ tumble around like clothes in a drier. Lindsay Connors’ piece goes to the heart of the matter – a video in which we see a fruit (banana) suspended from a meathook. Delicate hands stretch deep pink elastic bands one at a time over and around it. Pressure builds until it erupts from one end, flesh dripping to the surface below. Sexual connotations are instant and obvious. Simultaneously literal and metaphorical, repetitive in action, it speaks of possibilities in human relationships, no backstory necessary, only our histories and nerve endings, empowered by the work as it opens itself out, presenting simultaneously events of intense gentleness, relentless cruelty, possibilities of deception in soft hands, and a banana, a meathook, and elastic bands. At a very different place in the spectrum of objects, is Claire Manning’s ’In the shadow of Her Gaze’. Sass Tetzlaff’s pieces, ‘Reward’ and ‘Peace’ ask questions with (self) conscious reference to style. 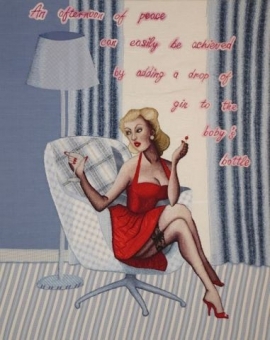 A mid 20th century female stereotype is presented, desirable in pinuppy, woman as desire – object fashion, but implicitly rather fed up with her lived life. The Job described as ‘well done’ in the embroidered text of ‘Reward’ is to cut up hubby’s suit in a wifely manner: ‘Peace’ is achieved by the delivery of a dose of alcohol in baby’s milk. Material from men’s’ shirts clothe the interior in which her life plays out. Misrecognised, disguised, as it were, as wallpaper and décor, the male presence gazes even (and perhaps especially) in his physical absence. 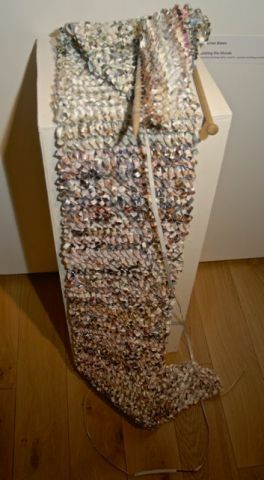 Cousin to the fabric pieces is Xaverine Bates’ work, ‘Knitting the Shreds’. Tension is often a family thing, shredding a violent act, one of denial perhaps, and rejection. A long scarf-like piece is knitted from the cut up pieces of photographs from the artist’s own past, destroyed like the husband’s suit but now reconstituted, strait-jacketed into stitched claustrophobic closeness. 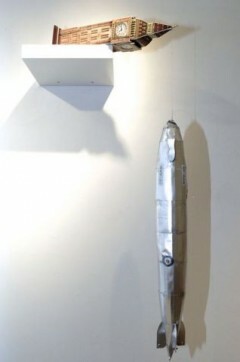 In Alex Wood’s ‘Time Flies’, it has flown; absence and loss infuse the piece A model of Big Ben lies on a shelf. From it is suspended a model (or are they toys?) Zeppelin (R31) with RAF roundels; they wait vainly in palpable silence for the child’s return. Notions of model and toy echo distinctions – tensions even – between art and non- art objects, concept and form, the possibilities of objects. The Earth Tower in Will Gould’s ‘Earth Tower and Untitled Container’ has crumbled a little. As it dries will it crumble further, spread to the floor and return to the earth? Or will the experience of drying make it stronger, only to delay eventual and inevitable entropy? There is organic material secreted in the soil and stones. No doubt too the seeds of living things lie dormant in anticipation of the freedom that the crumbling will deliver. Its empty container which is also a mould remains like a worn shirt. Linda Simon’s ‘Ctrl 2013’ sounds technical. The control key on the computer is used in conjunction with other keys to perform standard functions. This piece knitted on a domestic knitting machine, works in its softness against the grain of virtual imagery whilst employing punch cards similar to those used in early computing. Woollen computer cabling can never have the potency required to generate woollen printouts. Ironic then that the punched card controlled knitting is a reproductive system akin to printing. Softness hints at nostalgia. There is a lace connection across the gallery with Dawn Cole’s work. . Simon’s piece includes an ‘Evil cat head’ composed of lace-like punchcards which in turn are reminiscent of antimacassars, pieces of lace work placed on the backs of chairs to prevent ‘Macassar Oil’ which men used on their hair, ( an early Brylcreem!) from staining the fabric. They would have been in use at the time of WW1, when Dawn Cole’s Great Aunt was writing her diaries in France. Her work, different again, is based upon her Great Aunt Clarice’s diary entries from her experiences as a nurse during World War 1 in France. Cole takes phrases form the diary, ‘One Man Very, Very Bad, Nearly Navy Blue in Colour’ ‘2 Men Have Pieces of Shrapnel in Their Eyes’, ‘Fit For Nursing ‘Wounded’, matter-of-fact titles for agonising events. These images are a form of etching (Solarplate). The words are printed in white on black in lace-like patterns and in places are so overlaid that they are illegible. Only at the edges can the text be read. The shapes and patterns of lace lend added irony through delicate presentation, to matter-of-fact suffering. Frances Bristow’s piece, ‘Bursting Seedpod’ is a moment of calm waiting for the fuss to die down, a Great Aunt at the Front. The show offers stopping off points in the myriad conversations progressing within the works of particular artist, opportunities for reflection and reassessment, their relation to the wider cultural context. In this there is a set of tensions created where form and content become whole, when form is content and content is form. What a work might mean then and to what it refers, such as feminist theory or archival material, has aesthetic connotations and implications for its nature as an object, and consequently to the ways in which we can relate to it when we stand in front of it.